Block graphs are the first step in data handling and your KS1 child will learn to draw them, read them and use them to record information. We explain what you need to know about block diagrams and how they're used in the classroom. What is a block graph or block diagram? 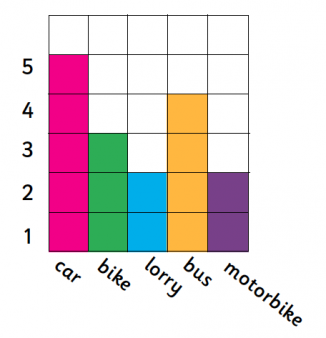 In KS1 children find out information and learn to present it in a block graph (or block diagram) where types of items are shown on the x axis (horizontal), number of items are shown on the y axis (vertical) and one block represents one item. For example, they may be asked to carry out a traffic survey, where they have to keep a tally of all the cars, bikes, lorries, buses and motorbikes that they see on the road going past the school. More able children may just be given the squares and then asked to label the numbers and names of vehicles themselves. How are block diagrams used in the classroom? Which vehicle did you see the most? Which vehicle did you see the least? How many more cars than lorries did you see? How many vehicles did you see altogether? The teacher may also discuss with them the difference between presenting their information as a tally and as a block diagram. They may talk about which is the better representation of the data and why. Working with block graphs is the foundation for learning about bar charts. It helps to familiarise children with the concept of numbers on the vertical axis and labels on the horizontal axis. When drawing a bar chart, children will need to think about how wide the bars are and whether they are going to have gaps between each bar. A block diagram is easier, as it just involves colouring, but introduces children very early on to a visual portrayal of the information they have gathered. Block diagrams may be used as part of cross-curricular learning, for example: the children may have a geography lesson about traffic where they take the tally, then use their maths lesson to draw up the block diagram, then have a literacy lesson where they write a recount of the investigation they have carried out. Find out about all the charts, diagrams and tables used to record information in primary school, plus worksheets, games and hands-on practice activities. What is a tally chart?